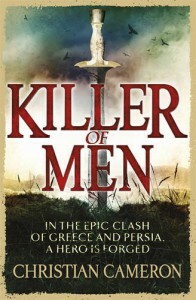 http://abitterdraft.blogspot.com/2013/06/review-killer-of-men-by-christian.htmlKiller of Men is the first in Christian Cameron's The Long War series, which outlines the conflict between the Greeks and the Persians around the 5th century BC. Killer of Men is centered primarily around the Ionian Revolt, and it makes for a great story.The story is told in the first person, though it's one where the protagonist narrates from old age. There seems to be an influx of novels that do this and it can be very hit or miss as to whether they turn out well. Some, like Pat Rothfuss's Kingkiller series, are narrated in the same way, but the narrator, Kvothe in this case, begins his tale and it essentially turns into a normal first person perspective until a new chapter where the Chronicler has run out of ink or some such thing and the novel returns to the present. In Killer of Men, Arimnestos of Plataea is the narrator, telling his story to his thugater, or daughter, and a group of her friends. Arimnestos interrupts himself in his telling many times each chapter, primarily to ask for wine or to comment on his daughter's blushing, and this annoyed me a little because it broke up the narration. The further in the novel I progressed, the more the style grew on me. Some stories are better told through a direct first person rather than a narration, and I think I really would have enjoyed this more if it weren't a narration. Despite this, Killer of Men only got better as the story moved along.We see Arimnestos develop from a young farm boy into a brutal killer of men, and from the moment he was betrayed and sold into slavery his development is kickstarted. Killers of men, as Cameron describes them, are very similar to David Gemmell's baresarks from his novel Legend - as soon as they have the scent of blood, they're a completely different person - and we see this in Arimnestos's often brutal recollections as well as how it affected him then and especially in the present. Throughout his time as a slave, he sees the stark contrast between his home of Plataea and Ionia. Cameron is adept at his worldbuilding, painting a superb picture of ancient Greece.Quick pacing - even in the parts that seem like they would be dull, great worldbuilding, and strong characters made Killer of Men a thoroughly entertaining read for me and should do the same for anyone even remotely interested in ancient Greece. Marathon: Freedom or Death is the second in the series, and as it was one of the most important battles of the era, I am very eager to read it and other works by Christian Cameron.